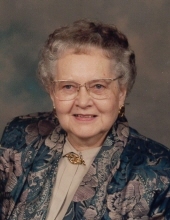 Laura M. Umphenour passed away November 22, 2018 at the Good Samaritan Home in Beatrice. Laura Margaret was born December 5, 1929 in Columbus, NE to Walter D. and Helen M. Greiner Brenneman. She was born with congenitally dislocated hips so had multiple surgeries as a child and young adult. In the early 1930’s when at Bryan Memorial Hospital in Lincoln, she lived with Miss Dean, Head of Nursing, in William Jennings Bryan’s former home, then used as nurses’ quarters. She was a poster child for the Crippled Children’s Fund at one time. She graduated from Columbus High School in 1947 and then attended Lincoln School of Commerce. She worked as a secretary at Russell Stover Candies in Lincoln. She was married to Robert Umphenour on May 20, 1953 at St. Paul United Methodist Church in Lincoln. They resided in California and England while Robert was on Air Force active duty. Their first daughter, Deborah, was born in Norfolk County, England in April 1954. They returned to Beatrice in 1955, where Robert (Bob) worked with his father and brother at the family business, Umphenour’s Supermarket. Daughter, Terri, was born in November 1956. Laura was a Brownie leader and 4-H leader for her daughters and used her secretarial skills part-time at Umphenour’s Supermarket and other places in Beatrice. She was a long-time member of Centenary United Methodist Church and was active in the UMW, Altars Gate Circle, Keystone Supper Group, and Church Women United. She also was a member of the Patio Gardener Extension Club, AARP, ROAL (Retired Officers Association Ladies of Lincoln) and other organizations. Playing bridge was her passion and she played in multiple groups. She liked going to lunch at the Senior Center and staying for afternoon bridge. While living at Samaritan Springs, she enjoyed many games of Mexican Train Dominoes, and hosting bridge friends. Survivors include her daughter, Terri (Timothy) Johnson of Hershey; four grandchildren: Craig (Jennifer) Johnson of Omaha, Karissa (Ryan) Sander of Greenfield, Massachusetts, Jessica (Dennis) Lyons, and Maggie Hackler of Beatrice; eight great-grandchildren; one great-great-grandchild; three sisters-in-law: Virginia, Cleone, and Anita Brenneman; nieces and nephews. She was preceded in death by her parents; her husband, Robert (1993) daughter, Deborah (2017) and son-in-law, James Hackler (2012); three brothers, Robert, James, and Donald Brenneman; three sisters, Dorothy Olsen, Betty Lovelace, and Erma Brenneman; and one brother-in-law, Duane Olsen. Funeral services will be held at 11:30 A.M. on Tuesday, November 27, 2018 at Centenary United Methodist Church of Beatrice with Rev. Mark Schutt officiating. Burial will be at Evergreen Home Cemetery of Beatrice. A family prayer service will be held at 11:15 A.M. on Tuesday in the library of the church. The body will lie in state at the Fox Funeral Home on Monday from 8:00 A.M. until 8:00 P.M. and then one hour preceding the service at the church on Tuesday. In lieu of flowers, memorials are suggested to the Beatrice Senior Center or the giver’s favorite charity. www.foxfuneralhome.net Fox Funeral Home of Beatrice is in charge of the arrangements. To send flowers or a remembrance gift to the family of Laura Umphenour, please visit our Tribute Store. "Email Address" would like to share the life celebration of Laura Umphenour. Click on the "link" to go to share a favorite memory or leave a condolence message for the family.